The Magical History Tour: A Beatles Memorabilia Exhibition will take visitors on an unprecedented journey of the Fab Four’s ground-breaking career that’s not to be missed. Get ready for the British Invasion at Henry Ford Museum. Beginning April 30, 2016, The Magical History Tour: A Beatles Memorabilia Exhibition will take visitors on an unprecedented journey of the Fab Four’s ground-breaking career that’s not to be missed. The Magical History Tour offers guests the opportunity to retrace the steps of the Beatles and the way in which they changed the music industry and influenced American pop culture with the best private collection ever assembled, that highlights their formatives years in Liverpool and Hamburg, the screaming fans across the world and goes into the studio for the creation of some of the most innovative music in history. Beginnings, Influence and Life in Liverpool: Guests will be immersed in the atmosphere of late 50s/early 60s Liverpool. Part of the very stage that supported some of the band’s early shows is on display, as well as instruments, personal letters and photographs, and various documents detailing the growing fame of the Fab Four. These artifacts are incredibly rare, as they come from a part of the band’s history before it was illuminated by the international spotlight. Life on the Road: Next, guests are swept up in the hysteria as the Beatles take America, and the world, by storm. See and hear what it was like to experience one of their concerts from their perspective, and immerse yourself in the amazing volume of Beatles merchandise produced, from replica instruments to clothing, costumes, board games and trading cards. Become your favorite Beatle as you interact with the fashion that set the lads from Liverpool apart. Innovation in the Studio: You’ve already heard the music. Now is your chance to discover how the Beatles’ music was created: by mixing it yourself. Explore the cutting-edge techniques used in the studio to craft some of the most enduring music in history. This gallery places guests right in the studio, up close and personal with the tools that built some of the greatest rock and roll albums of all time. The Decade of the Break-up: The dissolution of arguably the greatest rock band of all time left the world in disbelief, however it was not just an end, but also a beginning. This gallery is an exploration of the lives and careers of the individual members post-Beatles. It explores the different paths each Beatle has taken, both musically and personally, and presents an astounding collection of artifacts from this period, including the last autograph John Lennon would ever sign. The Magical History Tour: A Beatles Retrospective opens April 30, 2016 and closes September 18, 2016. Tickets for members are $5. Non-member ticket prices include admission to the museum and are $26 for adults (13-61), $20.75 for youth (5-12), $24 for seniors (62+) and children 4 and under are free. 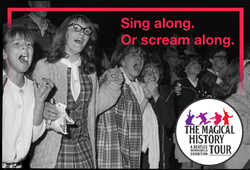 To purchase tickets, visit http://www.thehenryford.org/events/beatlesExhibit.aspx. The Magical History Tour: A Beatles Memorabilia Exhibition is not endorsed by, sponsored by, associated with, or otherwise affiliated with The Beatles, Apple Corps Ltd., or any member of The Beatles or their representatives. The exhibition is a collaboration between Exhibits Development Group, exhibition producer, manager, and distributor; and PMA Collective, co-producer and memorabilia collection owners. The culmination of the world-class talent brought to the table by each party ensures that this is an undertaking of the highest quality, from the memorabilia to design to production. The Exhibitionists are dedicated to the development, production, marketing, and distribution of traveling museum exhibitions and cultural projects. EDG serves as a partner to museums, foundations, collection owners and other exhibition organizers, in the U.S. and abroad in the care and stewardship of their exhibitions and collections. EDG’s mission is to initiate and promote international cultural and intellectual exchange by bringing high-quality traveling exhibitions of art, science, and history to broad and diverse audiences. The Henry Ford in Dearborn, Michigan is an internationally-recognized cultural destination that brings the past forward by immersing visitors in the stories of ingenuity, resourcefulness and innovation that helped shape America. A national historic landmark with an unparalleled collection of artifacts from 300 years of American history, The Henry Ford is a force for sparking curiosity and inspiring tomorrow’s innovators. More than 1.6 million visitors annually experience its five attractions: Henry Ford Museum, Greenfield Village, The Ford Rouge Factory Tour, The Benson Ford Research Center and The Henry Ford Giant Screen Experience. A continually expanding array of content available online provides anytime, anywhere access. The Henry Ford is also home to Henry Ford Academy, a public charter high school which educates over 500 students a year on the institution’s campus. In 2014, The Henry Ford premiered its first-ever national television series, The Henry Ford’s Innovation Nation, showcasing present-day change-makers and The Henry Ford’s artifacts and unique visitor experiences. Hosted by news correspondent and humorist, Mo Rocca, this Emmy®-winning weekly half-hour show airs Saturday mornings on CBS. For more information please visit our website thehenryford.org.